For the past little while I’ve had many opportunities to be able to speak in front of a lot of IT professionals (both administrators and developers) about PowerShell. This has included touring with the EnergizeIT Certification Bootcamp User Group Tour and presenting at various local user group events here in Ottawa. It also included helping out a little at the PowerShell demo station at the IT Pro week of TechEd 2008. All of this has been great fun because I really love being able to talk face-to-face with IT professionals and help them with their problems (I guess sitting in a cubicle for 10 years writing code must have gotten to me). If you go into cmd.exe to run some command, do it in PowerShell instead. In general, this recommendation works well because you can draw from skills you’ve acquired while using cmd.exe and apply those directly in PowerShell. These commands don’t work exactly the same way they did outside of PowerShell, but in most cases you won’t notice and you can start getting comfortable using the PowerShell console instead of cmd.exe. It is often the first command that anyone will try in PowerShell when they open it for the first time if they haven’t seen demonstrations showing all of the cool commands like Get-Service, Get-Process, Get-QADUser, etc. (aside from help, but what else are you going to try in a command shell you’re not familiar with where your current directory is somewhere in the file system?). It has a ton of command-line arguments to allow you to do some really complex directory searches on the file system with a very pithy command syntax. It outputs some useful details and aggregate information that is not part of the list of objects returned. It isn’t a standalone application that can be simply run from PowerShell. That’s not quite the same syntax as dir /s *.ps1 and it will definitely take some getting used to. Also, if you were looking for the total amount of space consumed on the hard drive by these sorts of files like you would get in the results from cmd.exe, you won’t find that in PowerShell either. This can be quite frustrating, especially to the newcomer. Please note that the value of 2 is actually the integer value of [System.IO.FileAttributes]::Hidden and the ? is an alias for the Where-Object cmdlet. In practice I would use the [System.IO.FileAttributes]::Hidden enumeration instead of the value of 2 because I don’t have the attribute values memorized, but I am using pithy commands as short as I can make them to illustrate a point. In both of these cases, as well as every other case I could come up with using dir, the old cmd.exe dir command syntax is shorter and it produces more information. Plus, like many PowerShell users who have been using cmd.exe for a while, I already know the switches that are available in dir today. There are a ton of cases like this because dir has so many switches that it supports, and these switches can be combined in many different ways to produce very useful results. Each of these switches works in Windows Vista and Windows Server 2008 but they don’t work in Windows XP or Windows Server 2003. And by default, they don’t work in PowerShell either. Run back to cmd.exe when working with the file system because it already works (if it ain’t broke, don’t fix it). Translate the dir commands you use into PowerShell dir (or Get-ChildItem or gci) syntax and use them. Find a Poshoholic and ask him to help. Writing the PowerShell pipeline equivalent of dir to the host, regardless of which switches are used (this can be disabled). Full alternate file stream (AFS) support on demand; this includes retrieving alternate file streams, blocking or unblocking files, and adding or removing alternate data streams on any file or folder. Even on Windows XP and Windows Server 2003 where dir in cmd.exe doesn’t support retrieving this information! Filtering options for files that are not content indexed and showing reparse points (not to mention any other attribute filters that are supported by dir) on all platforms supported by PowerShell. Recognition of and support for the dircmd environment variable. Support for every dir switch that is available today. Outputting detailed header and footer information just like you get from dir in cmd.exe. See that green block of text in the screenshot? That’s tutorial information, showing you the dir command you typed as well as the equivalent PowerShell command. This is output no matter what your dir command is, unless you disable it by running “$PSTutorialDisabled = $true”. Want the tutorial back? Just remove the $PSTutorialDisabled variable or set it to $false. Also if you noticed, the screenshot output includes detailed header and footer information plus integrated alternate file stream details like you get in dir. That output is controlled by a script I wrote called Process-FileSystemChildItem (alias: pfsci), which you can see being called in the PowerShell equivalent script generated by the tutorial. This modular support for outputting header and footer details as well as alternate file streams allows you to use Get-ChildItem and pipe the results to Process-FileSystemChildItem, selecting which output options are important to you. This file contains the required commands to load all of this functionality into PowerShell, provided that all items are in the same folder. To use this functionality in PowerShell, simply dot-source this file after you have downloaded it and all required files. 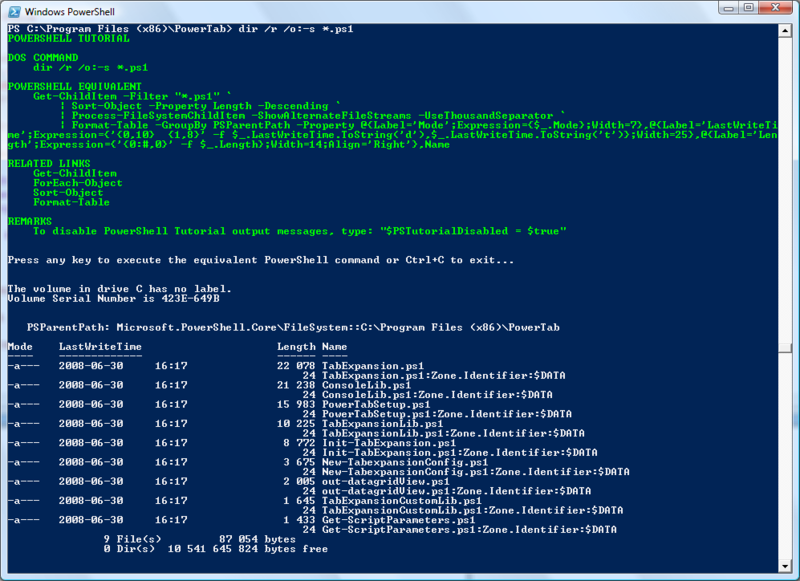 This is the easiest way to extend PowerShell using this functionality. This file contains the script that processes the dir command you enter, parses it, generates the equivalent Get-ChildItem pipeline, outputs the tutorial information to the host and executes the command. To use this command, simply invoke the script file directly using the call operator or dot-source the file and use the dir alias it creates. This file contains a script that supports outputting detailed header and footer information with pipelined file system items as well as alternate file stream information. If the required type data and format data files are automatically loaded into the PowerShell session if they haven’t been loaded already. To use this command, simply invoke the script file directly using the call operator or dot-source the file and use either the Process-FileSystemChildItem or the pfsci alias it creates. This file contains a script that supports loading localized resources to be used in PowerShell scripts. This is a utility command often used when making parameters required, and therefore this file must either be placed in your path or it must be dot-sourced to create the Get-PSResourceString and grs aliases. I use this internally when reporting certain errors back to the host, and I always call it by name without a path. If you don’t update the type data manually, when you call Process-FileSystemChildInfo the type data will be updated automatically as long as the file is in the path or in the same directory as the Process-FileSystemChildInfo.ps1 script. You must use -PrependPath to import this file correctly. If you don’t update the format data manually, when you call Process-FileSystemChildInfo the format data will be updated automatically as long as the file is in the path or in the same directory as the Process-FileSystemChildInfo.ps1 script. Once you’ve downloaded these files, unblocked them and imported them into PowerShell, dir should work as well for you (better in some cases) as it does in cmd.exe, and you should have additional management support for blocked files and alternate file streams in general through PowerShell itself. And hopefully, you’ll learn more about PowerShell along the way! P.S. Thanks to /\/\o\/\/ (Marc van Oursow) for the work he did with alternate file streams in this post and for the related files he included in PowerTab. This work was my starting point for the support for alternate file streams. My extension here differs slightly from his in that I don’t use a dll (this allows me to support both 32-bit and 64-bit platforms), my method signatures are slightly different and I added support for folders since they can also have streams added to them, but his work gave me a big head start on this. Previous Post PowerPack Challenge now open!